Journalists in Abuja who went to cover the commencement of the ongoing 2019 Unified Tertiary Matriculation Examination,UTME,were barred from entering examination halls to take pictures and videos of the process. This was as security operatives attached to Childworth International School, one of the centres in Masaka,Nasarawa State, working on the directive of some JAMB officials at the centre, confiscated Vanguard reporter’s phone following pictures and videos he took at the Computer Based Test,CBT centre. After establishing that some pictures and videos of some candidates and the examination process were saved on the phone,the security men drawn from the Nigerian Security and Civil Defence Corps, the Nigerian Army and plain detectives believed to be from the Department of State Services,DSS,insisted that the saved items be deleted. After deleting the items, the officials instructed the security men not to allow journalists inside the premises anymore. At the centre, candidates were seen writing the examination which first batch began at exactly 8am in orderly manner. But some candidates were grumbling following failure of their computers to function as expected. Five candidates at the centre who participated in the first batch of the examination and who faced the problem were prevented by the examination officials from speaking the journalist. An official who identified himself as the centre administrator but refused further identification,told Vanguard that candidates affected by the failure of their computers to function as expected, would be given additional time to finish their work. Also,at the Global Distance Learning Institution,one of the CBT centres at the Central Business District in Abuja, journalists who went to monitor the process were told not to take pictures and videos in the examination halls. 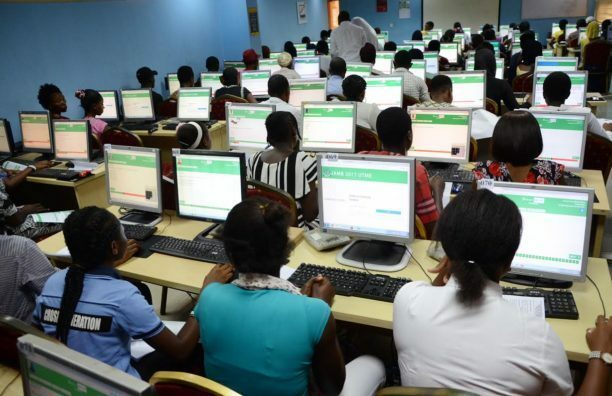 The centre administrator, Emeka Wunaka,said he was acting on instruction from JAMB that no journalist be allowed to record,take pictures or videos of the process. Although he said journalists can watch as the candidates write their examinations,he, however,said they must not take pictures or video the process. It was not different at Sascon International School, in Maitama,Abuja. Journalists who went to the CBN centre could not be allowed inside the hall. The center administrator,Mrs Agboola Adesua,said they were instructed not to allow newsmen take pictures or video of the candidates in examination halls, especially when they are writing the examination. One of the candidates,she disclosed, could not be allowed to write the examination following the failure in the biometric test. But she said the matter had been forwarded to the appropriate quarters, assuring that it would be resolved. Recall that a total of 1.9 million candidates registered to sit for the examination which commenced across the country, Thursday.